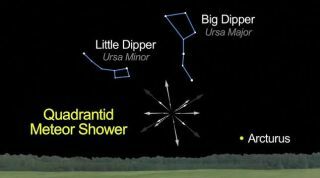 This sky map shows where to look in the northeastern sky to spot the annual Quadrantid meteor shower, which peaks overnight on Jan. 3 and Jan. 4, 2011. It will appear between and below the Big Dipper and Little Dipper constellations. The year 2011 promises to be a dazzling onefor skywatchers, and it hits the ground running with a partial solareclipse and meteor shower. But those two sky spectacles are just thebeginning for 2011. Here are some of the more noteworthy sky events that willtake place over the next year. SPACE.com's Night Skycolumn will provide more extensive coverage of most of these events as theydraw closer. Jan. 4 ? Meteor shower, solareclipse and planets (oh my! ): An action-packed day on the celestialcalendar. First, the Quadrantid Meteor Shower reaches its peak during thepredawn hours. It?s one of the best meteor displays of the year, with 50 to 100meteors per hour. Those living in Europe and western and central Asia shouldhave the best views. As a bonus, those areas of the world will witness apartial eclipse of the sun on this same day. The greatest part of the eclipse, where nearly 86 percent ofthe sun?s diameter will be covered, occurs at sunrise over northeastern Sweden,along the Gulf of Bothnia, near the city of Skellefte?.Cities in Western Europe, including Oslo, London, Paris and Madrid, will alsoenjoy a sunrise eclipse. Finally, Jupiter will engage Uranus in thelast of a series of three conjunctions; there have been only six such tripleconjunctions between 1801 and 2200.The last was in 1983 and the next willcome during 2037-38. March 15 ? Mercury and Jupiter drawclose: Like two ships passing in the twilight, Mercury and Jupiter comewithin 2 degrees of each other this evening. For comparison, your fist held atarm's length covers about 10 degrees of arc in the night sky. Jupiter will be heading toward the sun, while Mercury ismoving away from the sun during this time. Immediately after sunset,concentrate on that part of the sky just above and to the left of where the sunhas just set. Using binoculars, sweep around this part of the sky to see brightJupiter sitting just below and to the left of the harder-to-spotMercury. May (all month long): Fourof the five naked-eye planets will crowd together into what could be describedas a Great Celestial Summit Meeting. Mercury, Venus, Mars and Jupiter are contained within a10-degree span on May 1, shrinking to a minimum of less than 6 degrees on May12, then opening back up to 10 degrees on May 20. Twice during May, three planets close to within nearly 2degrees of each other: Mercury-Venus-Jupiter (on May 11-12) andMercury-Venus-Mars (May 21). And the crescent moon joins the array on May1 and again on May 30-31. June 1 ? A partial eclipse of thesun: The zone of visibility for this eclipse covers parts ofnortheast Asia, where the largest eclipse occurs over CheshskayaBay and the Bolshezemelskaya Tundra of farnorthwestern Russia. Here, the upper three-fifths of the midnight sun willappear bitten away. The eclipse will also be available to the northerntwo-thirds of Alaska (an early afternoon event), as well as northern andeastern portions of Canada, where viewers will see the eclipse during thecourse of their afternoon, as the sun slowly descends toward the west-northwesthorizon. Greenland and Iceland are also within the eclipse zone,the latter getting a view just before the sun begins to set in their lateevening. The penumbral shadow quits the surface over the open waters of theAtlantic to the east of Newfoundland, as the sun passes out of sight. At mid-eclipse, the moonpasses just north of the center of the Earth's shadow. As such, the duration oftotality is an unusually long 100 minutes, which is just seven minutes shy ofthe absolute maximum for a total lunar eclipse. In fact, over the last onehundred years, only three other eclipses have rivaled the duration of totalityof this eclipse: 1935, July 16 (101 minutes); 1982, July 6 (107 minutes), and2000, July 16 (107 minutes). Aug. 13 ? Perseidmeteor shower: More of a lowlight than a highlight; the annual summerperformance of the Perseid meteor shower willbe severely hindered by the light of a full moon. Oct. 8 ? Draconidmeteor shower: Many meteor experts are predicting a good chance that anoutburst of up to many hundreds of Draconid meteorswill take place. Unfortunately, like the Perseids, abright moon could severely hamper visibility. The peak of the display isdue sometime between 16h and 21h UT, meaning that the best chances of seeingany enhanced activity from these very slow-moving meteors would be from EasternEurope and Asia. Nov. 10 ? Mars and bright star:A colorful conjunction takes place high in the predawn sky between theyellow-orange Mars and the bluish-white star Regulusin Leo, the Lion. They are separated by 1.3 degrees, but they?ll bewithin 2 degrees of each other for five days and within 5 degrees of each otherfor nearly three weeks, so they will be a rather long-enduring feature of themid-autumn morning sky. Nov. 25 ? A partial eclipse of thesun: The earth?s penumbral shadow brushes the southern and western portionof South Africa. Greatest eclipse ? nearly 91 percent of the sun?sdiameter covered as it reaches a magnitude of 0.905 ? occurs at a point in the Bellingshausen Sea along the west side of the AntarcticPeninsula. The shadow (just barely) manages to pass over Tasmania aswell as portions of New Zealand's South Island. In fact, the last contact ofthe shadow with Earth occurs just to the west of the South Island, in theTasman Sea. Dec. 10 ? A total eclipse of themoon: The side of the Earth that is facing the moon during this event ischiefly the Pacific Ocean, with eastern and central Asia seeing this as anevening event, while for North Americans this is a pre-sunrise affair. From a spot in the Philippine Sea, south of Japan andeast of Taiwan, the moon will stand directly overhead during the middle of theeclipse. For those living in the Eastern Time Zone of the U.S. and Canada, themoon will have already dropped out of sight beyond the west-northwest horizonfor those living near and along the Atlantic Seaboard. Over the central U.S. and Canada, the moon will becomeprogressively immersed in the umbra as it approaches its setting; the fartherwest you go, the larger the obscuration before the moon goes out of sight. Thewestern U.S. and Canada will be able to see the total phase. Dec. 13 ? Another low-light meteorshower: The Geminid meteor shower, now ranked as the best ofthe annual meteor showers, has the misfortune of occurring during the time of awaning gibbous moon, which will pretty much squelch all but the brightestmeteors.